The Partnership works to coordinate and strengthen local action to secure a functioning, sustainable and resilient bio-diverse natural environment to improve the health, well-being and livelihoods of people in the Tees Valley. We aim to be a strategic platform to champion the value, and secure the future, of a healthy functioning natural environment through cross-sector working to enable outcomes for nature, people and the local economy. influence local plans, strategies and policies to integrate the delivery of environmental benefits and services alongside economic and social benefits. 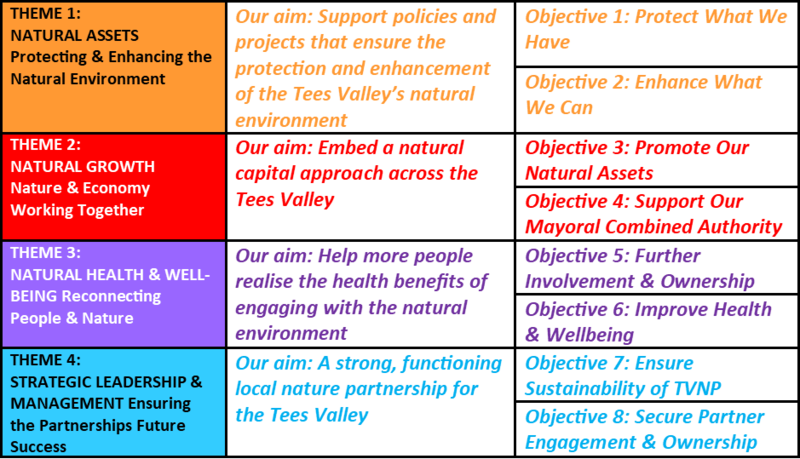 As well as identifying strategic priorities for the natural environment, the TVNP will coordinate activity, reduce duplication and find new ways to bring new investment to improve the quality of the natural environment and deliver social and economic benefits.